The 2015/16 Speedway City season came to a thundering end with the running of the 2016 Crane Services South Australian Late Model Title with the 30 lap finale providing one of the best races of the season as New South Welshman Ben Nicastri added the State Title to his growing resume. Second across the line was fellow Sydneysider Dean Hickey who edged past early race leader Matt Crimmins with only a handful of laps remaining. The Speedway City season will go out with a thundering roar this Saturday night (April 23) as the Adelaide venue hosts the 2016 South Australian Late Model Championship. Despite the class being established in South Australia for several years now this will be the first time that Speedway City has conducted the title event and the decision to run the title at the 430 metre venue has been well received with 18 drivers from four states set to compete this weekend. Strathalbyn’s Daniel Pestka drove into Speedway City’s “Jack Daniels Victory Lane” for the second time this season last Saturday night as he won a drama filled Sprintcar season finale. After starting on the pole for the City of Playford Mayors Cup Pestka pulled a massive wheel stand on the start forcing him to drop back into second but he was quickly back in front of the field as he made the pass on lap 6 and went on to win the 35 lap final ahead of Aidan Hall, who recorded a career best finish, and Mark Caruso. Saturday April 9, 2016 Who Will Be The Mayor of Speedway City? After nine rounds of the Revolution Racegear Speedway City Sprintcar Track Championship it has come down to battle between Steven Caruso and rookie Sam Putland for the overall crown and the Champion will be decided this Saturday night. Throughout the year Caruso has been a model of consistency but he stamped his authority on the series with a win in the previous round and he enters the double points final as the most likely to claim the overall prize as regardless who wins he only needs an eighth place finish in the 30 lap $5,000 to win City of Playford Mayors Cup, Presented by Jack Daniels A-Main. In what was a dominant display on Easter Sunday 16 year old Tyson Williams emerged as the inaugural South Australian Legend Car Champion at Adelaide’s Speedway City as he defeated Rob Rawlings and Victorian Champion Glen Arnold in the 20 lap Jack Daniel’s supported finale. After remaining undefeated throughout his heat races Williams had to work hard for the win after losing the lead early to Rawlings but he was able to wrestle the lead back and he went on to record his second feature win in as many nights following his win at Murray Bridge. This Easter Sunday (March 27) night pack your chocolate eggs and Easter goodies in a basket and head out to Adelaide’s Speedway City for what will be a great Family Night out with the running of the annual “Easter Thrillerama”. This year’s event will feature the inaugural Jack Daniels South Australian Legend Car Championship, Wingless Sprints, Speedcars, Junior Sedans, Street Stocks, V6 Sprints, a Monster Fireworks Display and the always popular and hilarious National Karate Academies Caravan Boat and Dunny Derby. Over the years this event has become a tradition at Speedway City and it regularly attracts one of the biggest crowds of the season so if you plan to attend make sure you arrive early so you are not disappointed. Steven Caruso has led the Revolution Racegear Speedway City Track Championship since round 3 through sheer consistency but last Saturday night he put an exclamation mark on his series lead by winning round 9 of the series. Caruso led the entire 25 lap finale after starting on the outside of the front row and with only one round remaining he now holds a lead of over 200 points over his nearest rival, Sam Putland. Last night Loxton’s Keke Falland won his first ever 410ci Sprintcar main event victory as he won a titanic flag to flag battle in Round 8 of the Revolution Racegear Speedway City Track Championship. After starting on the pole courtesy of his two heat victories he lost the lead early to pre-race favourite Daniel Pestka but at the mid race point he made the decisive move in turn three after Pestka hesitated as he attempted to lap the slower car of Michael Burford. Following the successful George Tatnell Cup a fortnight ago the Sprintcars are back at Speedway City this Saturday night (February 20) for round 8 of the Revolution Racegear Track Championship. Currently Steven Caruso holds the points lead by a little over 60 points over his older Brother Mark Caruso, but with Mark not competing this weekend the points chase is set to be shaken up. Last night at Adelaide’s Speedway City Brooke Tatnell became the first two times winner of the George Tatnell Sprintcar Cup as he led all 35 laps after starting from the outside of the front row. After being defeated by Jamie Veal in the JRR Pole Shuffle Brooke wasn’t going to be denied victory in the race that honours his father as he totally dominated the final to defeat a fast finishing Steven Lines and Veal. This Saturday night Speedway City will be celebrating the life of Australian Speedway legend George Tatnell, with the running of the George Tatnell Sprintcar Cup, but in what is a huge bonus for the event the meeting will also feature another two racing names that George battled against for many years. Not only will Brooke Tatnell represent his Family name with pride at his Father’s event but the field will also include a Dumesny and a Brazier as well! 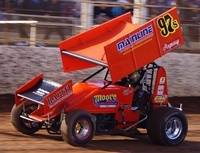 What do Ryan Jones, Ricky Maiolo, Luke Dillon, Steven Lines, Jamie Veal and Brooke Tatnell all have in common? They are all previous George Tatnell Sprintcar Cup Champions and they will be back at Speedway City on Saturday night attempting to become the first two times Champion of one of Australia’s most prestigious Sprintcar races. In addition to the six previous Champions another 29 drivers will suit up and chase the $10,000 winner’s cheque, but they will all be racing for more than just trophy, they will be racing to honour a true Australian Speedway legend. Joel Chadwick won this fourth successive Wingless Sprint A-Main victory at Adelaide’s Speedway City last night but this one was a little more special as he claimed the 2016 Murray Bridge Glass South Australian Championship. In the lead up to the event it appeared that the show wouldn’t even go ahead due to heavy rain in the area and as a result the track was extremely heavy and hooky but Chadwick mastered the conditions to perfection as he defeated Victorian Travis Millar and outgoing Champion Jarman Dalitz. This Saturday night (January 30) Murray Bridge racer Jarman Dalitz will put his South Australian Wingless Sprint Championship on the line as he contests the Murray Bridge Glass 2016 South Australian Championship at Adelaide’s Speedway City. With only one previous meeting under his belt this season Dalitz will have his work cut out as he takes on a further 28 entries from across the state and Victoria in what will be a hotly contested Championship event. "INFORMATION FORM IS NOW AVAILABLE FOR THE 2016 GEORGE TATNELL SPRINTCAR CUP AT SPEEDWAY CITY ON SATURDAY 6th FEBRUARY". After nominating only days prior to the event Matt Egel and the Downing Brothers racing Team proved that the late nomination was worth it as they dominated round 6 of the Revolution Racegear Speedway City Track Championship. After starting from position two Egel went on to lead the entire 25 lap journey that went from flag to flag defeating runner-up Mark Caruso by over half a lap. Following the successful Sprintcar Smackdown event on Boxing Day the gates at Speedway City will open for the first time in 2016 this Saturday night with Round 6 of the Revolution Racegear Sprintcar Track Championship and the JD Couriers Super Series for Super Sedans headlining the program. Last night Mount Gambier’s Steven Lines gave his car owner Brian Hall a late Christmas present by securing the $20,000 on offer in the inaugural Speedway City Smackdown. In front of a massive Boxing Day crowd Lines defeated James McFadden and Brad Keller, who secured his fourth successive Boxing Day Speedway City podium result. SPEEDWAY CITY LIVE AUDIO LINK - BOXING DAY SPRINTCAR SMACKDOWN..